We got back from our March break a couple of weeks ago and in spite of my great intentions to get back to my blog immediately, obstacles have prevented me from posting. We had the most wonderful trip to Europe and reconnected with important friends and family after far too long. Wonderful times staying friends and family, in their freezing houses. I fear I have become something of a wimp and spoiled by our lives in Canada. I shivered for days and days in cold kitchens, icy bedrooms and even colder bathrooms. For, ’tis true, British heating is stretched to the limit in cold stone houses with inefficient heating and huge bills. After a while we gave up and went to Marks and Spencers where we bought thermal underwear and long johns which improved things hugely and by the end of our visit we had developed a new thicker skin and it didn’t seem so bad after all. We went for lots of long walks – often to find that it was warmer outside than in. Go figure. But for me unfortunately getting cold means I get a cold and I returned with the most dreadful bug, colds (plural) and cough which have laid me low for a while. So we returned a bit under par healthwise and then Milo, the dog had his op, rather unsuccessful as no amount of searching his insides produced the missing testicle we had been looking for. Poor dog, he’s still a bit sore. But I have managed a bit of quilting. I have resolved to finish the hand quilting on my purple quilt before working on any other projects which doesn’t make for a great Blog post as it’s all a bit of a slow process. 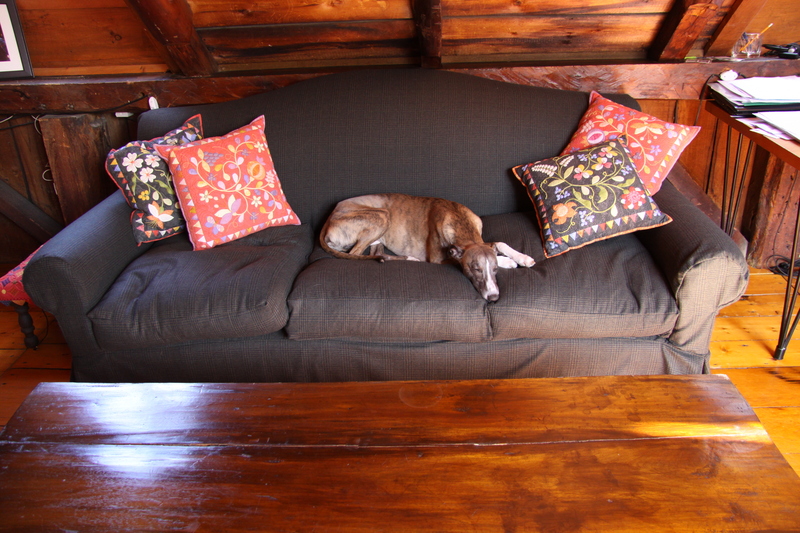 I made a new slip cover for an ancient sofa over the weekend with a bargain find of a whole 12 metre bolt of plaid flannel for $50. Not bad for a first effort…. 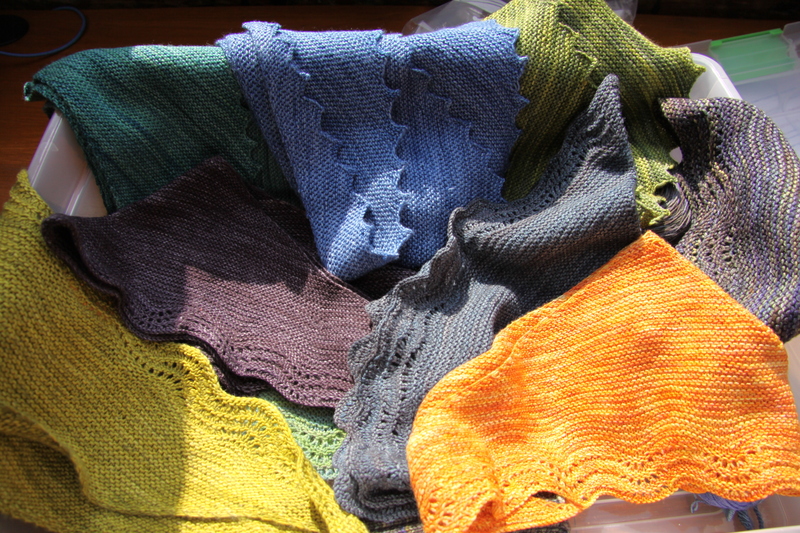 and I have done lots of knitting in gorgeous malabrigo yarns for my “presents stash”. Also not shown, and of which I am most proud are two lovely pairs of men’s socks that I gave away on our trip and several other scarves, handwarmers and stoles. I can’t seem to stop knitting. Stop press for local readers. Le Coin Artisinale is now stocking my favourite Roxanne Needles including my Number 9 Between that I rave about. Hoping that where you are you have Spring. Here we are longing for it and still awaiting temperatures above zero. 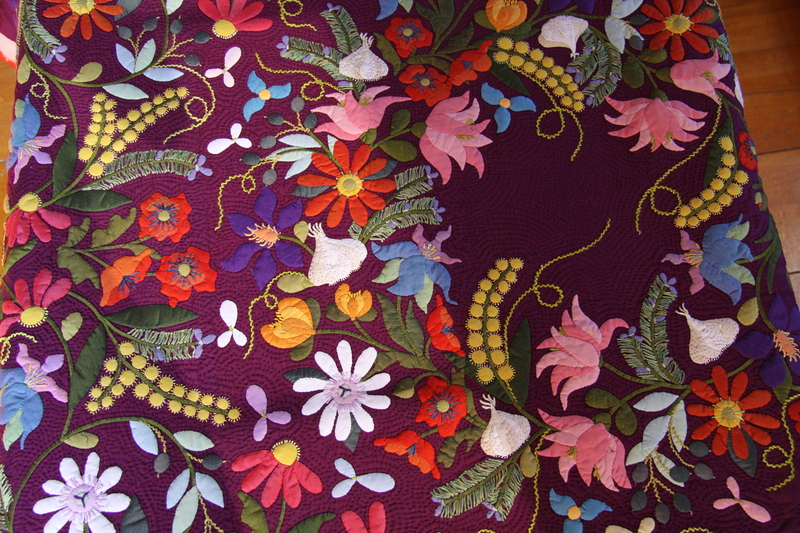 Back to quilting now….